We know: you just want to get to the questions and answers. New York City-based hairstylist La Shawn Thompson breaks down the first part to our most asked questions on Black hair. And don’t worry, she’s got so much more to share with BB readers. How do I actually grow my hair? The key to growing hair starts with a healthy and a clean scalp. A lot of women have the misconception that you have to grease your scalp. The scalp doesn’t have to be greased because it produces its own sebum. When it is greased, it is clogging the pores, which can lead to scalp disorders. Making sure the hair is moisturized with oil is key. For women with relaxed hair, a light oil will suffice. Women with relaxed hair can use heavier oils as a deep conditioner when shampooing. Women with natural hair can use hair butters. You can select which butter is best for you based upon your hair texture. Also, a healthy body contributes to you having healthy hair. A healthy eating regimen helps support hair growth. Remember, you don’t need hair in order to live, so the nutrients in your body go to the vital organs first. So make sure you get enough vitamins and minerals so that your hair gets its share as well. Create a regimen with your stylist. Deep condition weekly or biweekly, hair vitamins are a great addition and do not over shampoo. Excessive shampooing causes a reduction in the oil on the scalp which causes the hair to be dry. Dryness causes breakage. Follow these tips along with the help of a licensed beauty professional should start you on your journey to hair growth. Does getting my hair trimmed really help grow my hair? Ladies! Skipping out on trims will not support hair growth. Opting out of a trim when needed causes the hair to split more which means that you will have more hair to trim later on. What is the difference between a lace front and a wig? The difference between a lace front and a wig is the materials used when making the hairpiece. A lace front wig is made with a fine sheer material that creates a natural look. What’s great about a lace front is that it is very versatile. A lace front can be parted any way desired. Most times with a wig there is a style in place and the material that a wig is made with is not as breathable or interchangeable. A wig can be made with synthetic hair or human hair. How long can I really keep in a weave? A weave should be worn for no longer than two months. Once your weave is installed it should be shampooed every week to two, based on the level of activity. Once you reach two months the weave needs to be removed to prevent matting of the hair and breakage. How often should black women shampoo their hair? Black women should shampoo their hair weekly. Enviroment and products cause the hair to become dirty. Working out is a culprit as well as it causes the hair to sweat, which dries the hair out. When working out, you can use conditioner as a shampoo so that you aren’t over-shampooing which causes dryness. How can I tell if I have heat damage. 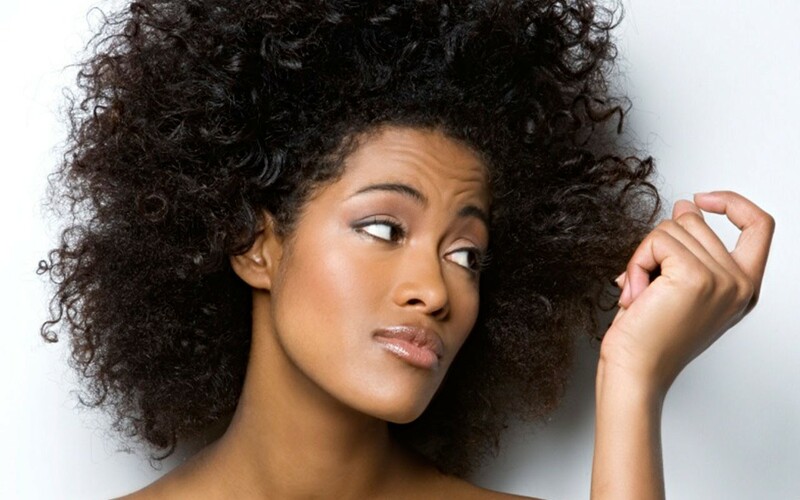 Relaxed hair and natural hair have different signs of heat damage. On relaxed hair, heat damaged hair won’t hold a curl and is dry and brittle. On natural hair, the curl pattern is altered. At the root, the hair will have its curl pattern. You can tell where the heat damage starts when you start to see the hair is straight (not curly) mimicking the look of a relaxer. Also, if the curl pattern is much more loose, showing a notable difference than the hair at the root, you can guess a bit of heat damage has been done. Is flat-ironing hair really that bad? Everything done in moderation is key. Flat-ironing the hair won’t damage the hair as long as the temperature isn’t too high. To all of my relaxed ladies, when using the flat iron at home, please remember to keep the heat low. The bonds of your hair are straightened already. Once my edges are gone, can I naturally grow them back? The first thing I tell my clients when it comes to hair loss is to get the advice of a dermatologist. A dermatologist can tell you if the follicle is alive or not. Then the doctor can inform you of what treatments that can work for that area. Now if you want natural treatments in that area, that is your choice. Coconut Oil, Olive Oil, Castor Oil and Argan oil are good natural remedies. Are there any alternatives to weaves that don’t require them being sewn in? The safest alternatives to a sewn in weave are clip-ins and wigs. A clip in is an attachment sewn on to a weft of hair. You can braid down the hair and clip on to braids or you can clip in between your [loose] hair. Another good alternative is wigs. The wigs that are being made today look natural and are easy to maintain. Colors like purples, blues, and pink are achieved in hair by lightening the hair first and then depositing the color of choice. There is a line named Olaplex which claims to limit damage after coloring with its unique system that bonds the hair together after a color process. It has rave reviews, so I would suggest trying that. Also, you can put clip-ins in to achieve these colors as well, which is much safer. Can I still get a relaxer and have healthy hair? Yes, you can hair healthy hair with a relaxer. Everyone’s hair is different. Some clients should wait 5 weeks and some 6-8 or longer. You will know if the hair starts to shed excessively that it is time [for a touch up]. Making sure you are deep conditioning regularly and keeping the hair moisturized are ways you can keep the hair healthy with a relaxer. What are the first signs that your hair is completely damaged? The first signs that the hair is damaged are excessive shedding and dryness. The first thing to combatting damaged hair is a good trim. You immediately see a difference. Follow La Shawn on Instagram and Twitter! I just witnessed my five year old granddaughter spend hours being braided with extensions. She cried and begged the braider and her mother to stop, saying, “I don’t want more braids. Please stop.” But it didn’t. It brought back memories of being subjected to the hot comb, with burns on my ears and neck, and relaxers with chemical burns. Her mother has hair issues, despite having a full head of hair, she never lets her natural beauty show, always wears wigs or extensions down her back. Nothing said can change her mind. Why do we make Black girls suffer? Is anyone else upset by this?